UPDATE Oct 10, 2008: “Paranoia” it is – so you know what’s been going on with the US and world economies lately. This morning George Bush spoke from the White House but only rehashed for us the actions that have been taken to calm down the markets and boost the economy such as the massive $700 billion Bailout Bill for Wall St, the Fed flooding liquidity into the system which banks so far are hoarding rather than loaning, etc. As Bush spoke today you may be interested to know that the Moon ranged from 24AQ03 to 24:07 (10:25 am edt to 10:33 am edt) which is actually a Moon Return to this Lunar Eclipse which predicted market paranoia. Chiron and North Node were both Rx 16AQ+, and Chiron was parallel Zuben Eschemali, the Beta Star of Libra, whose keynote is: ‘negative social and community reform with a strong power motive.’ (Brady’s ‘Fixed Stars.’) This is all about taking over, m’peops. It’s 11:46 am edt and TV news just said the DOW has “taken another wild plunge” so Bush’s attempt to calm the markets isn’t working so far. He’s right that anxiety isn’t helping at all. Mercury goes Direct in mid-October but must pass his shadow degree before things can move forward again (which means moving beyond his Rx degree of 22Lib49) so that’s the end of Oct-early November before Mercurial issues (statements, speeches, negotiations, contracts, etc) lighten up. Or that’s my hope anyway! Here is the Lunar Eclipse of August 16, 2008, set for Manhattan, NYC. Occurring two weeks after the Solar Eclipse of Aug 1, this Lunar Eclipse may be a trigger to market meltdown because the Solar Eclipse of August 1 is in the 10South Series–the Pre-natal Eclipse Series of the NYSE. Puetz began his research with the Holland Tulip Mania of 1637 and ended with the Tokyo Crash of 1990. His conclusion is that the greatest number of crashes began appr 6 days prior to 3 days after the Lunar Eclipse that occurred within 6 weeks of a Solar Eclipse. Both the February Eclipses AND the August Eclipses fill the ‘within 6 weeks’ bill. Of course, this perfectly describes the current atmosphere on Wall Street and elsewhere, doesn’t it? Yet, as Paulson, Bernanke, Bush, and others continue to reiterate, the US economy is resilient, etc…so will it take the Eclipses of August to deliver the coup de grace? http://www.spiritoftruth.org/stockmarketcrash.htm and I know you can find many others. However, as I’ve already published here, the NYSE’s Pre-natal Eclipse Series’ next manifestation–the August 1, 2008 Solar Eclipse–causes me to wonder if the current market weakness is leading up to a more dramatic financial catastrophe in August of this year and triggered by the August Lunar Eclipse. This centers the time frame from Aug 10–Aug 19. 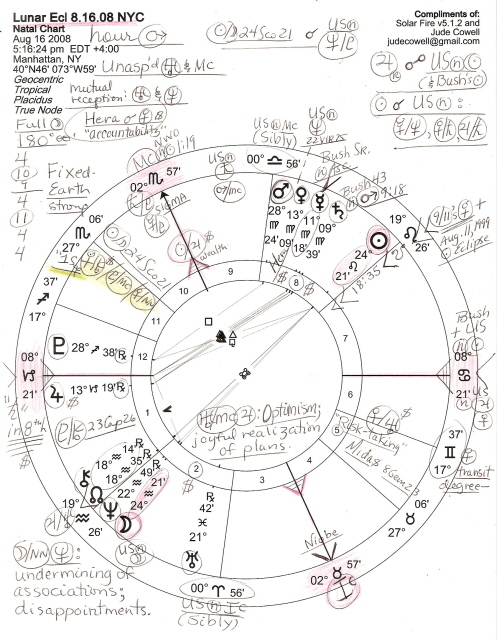 With the chart set for Manhattan, you see that the Sun is in 8th house of Credit, Debt, Insurance, Taxes, Shared Resources…in two words: High Finance; this puts the Moon (fluctuations; changes; publicity) in the 2nd house of Earnings and Personal Resources. It’s a Mars Hour Eclipse and the asteroid Niobe (‘the grieving mother’) is at Ic, with morally upstanding Sigma at Mc, along with the Sun/Jupiter midpoint…Sun/Jup = Mc: wealth; good fortune; success. Seems someone will be happy, but the bottomless money pit of Bush-Cheny’s war is all over the chart, omho, so the US economy and taxpayers–not so much. Moon/Neptune conjunct indicates much emotional idealism and disappointment through giving other people more credit than they deserve, and disillusions abound. ~~Using Dane Rudhyar’s version of the Symbols, plus Lynda Hill’s ‘360 Degrees of the Zodiac’ here are the Sabian Symbols for the August 16 Lunar Eclipse degrees but you may find that they are not very comforting, yet applicable all the same. Keywords: Self-sufficiency in the face of a long and exhausting adventure. Me, I don’t like the looks or feel of the “New World” the Illuminati have designed for the rest of us…how about you? Whew Lynda! All these resonate in some way with economics, the war being waged on foreign credit, oil reserves, and the above mentioned Moon-Neptune contact (“mirage.”) Of course, in another chart or situation, these cautionary words would resonate with other things, but that’s Astrology for you–it works on so many levels and is at least as complex as life on Earth itself! Yet perhaps there is hope within the Moon’s Symbol…this Moon’s degree is near the US natal ‘Sibly’ Moon (27AQ) and given how many possible birth charts there are for America, who knows but that “25AQ” IS the actual US natal Moon degree? Well, as they say, markets fall or rise primarily bwo emotional flights or depths, and if August means more trouble, consumer confidence and emotional insecurity may be, as if often the case, the gist of the matter, as well as emotional lows of market traders everywhere. And we know that “The Right Wing” is used to refer politically to the R Party, of course. Not letting one’s emotions color temporary circumstances will go a long way toward dealing with whatever problems surface–or are said to surface–in August. And there is moneybags Jupiter rising–although Rx and opposite US natal Sun, a time when material assets are depleted and our generosity benefits the wrong people–yet the planets in 8th house: Mercury, Venus, and Saturn–are being helpfully trined by generous Jupiter who will Station Direct 12Cap32 on or about Sept 8, 2008–thereby opposing US n Sun one more time at the end of the month. And Venus 13Vir09 is sextile US n Sun (a sextile is an aspect of opportunity–60 degr)..so creating one’s own opportunities is possible, although not a sure bet with a sextile. Images for Integration: The chairman of the board raises his glass to his able colleagues…The king of a large, prosperous empire invites everyone to his wedding. Well, it sounds like there will be celebrations SOMEwhere in the world. Here’s hoping they come to a market near you. i followed it but not being a Financial Astrologer it was only partially clear to me what he’s doing there…Fibonacci #s and the rest make my eyes cross ;p – still you’d think with a natal Jup/Saturn trine I’d be into financial stuff, wouldn’t you? So even though Alan Oken calls the Jup/Saturn trine “The Banker” I seem to have missed the banking boat! Love your comments on the psychics! The falconry is because I went to a bird of prey centre and was really stunned to see the eagle there. I don’t know, there’s something about hawks and eagles and so on that moves me – the wildness (even though it’s much less than that of their free relatives), the majesty… I just want to be near the birds and watch them fly! The “experience” days are expensive – once I get a course done i can go and volunteer somewhere and see them for free 😉 I don’t want to get into the hunting bit at all – any beasties “my” birds eat – other than those caught opportunistically – will be of the already dead and frozen variety. Hi Ekajati, sounds like a difficult time all right and i hope things are smoothing out for you now. Since i approved your comment before this one has auto-published so i hope you’re okay with that…and i do thank you for letting me know about your unhappy Eclipse results as difficult as they’ve been – sounds like you’re well out of the shamanic course. Here’s me with the feedback from July 12. I didn’t have a happy outcome with the eclipses. Not only the person who sent the flower never revealed themself, but the 3 year shamanic training course I nearly finished (end of yr2) suddenly stopped for me when it came to light that the teacher was corrupt and abusive. There was someone on the course who I had become very close to, but then tensions grew when I fell in love with him and he didn’t return the feelings. We claimed to want to still be friends and close for a long time, but he drifted away. Just before this summer’s camp was supposed to start (part of the course) it became clear that while I was still hoping for friendship and had been working hard on accepting our differences, he was full to the brim of brutal harshness for reasons undisclosed, and the last minute strands of that connection blew out of the water too. The spectre of cancer also raised it’s head again – my work colleague’s husband (a real angel) has a rare blood cancer and another young colleague is on her last legs and dying. The only positive thing is that not spending money on the course is freeing me up to see the world a bit (Arizona in December), finally learn to drive and possibly learn falconry. Thank you so much Jude!! I appreciate the feedback.